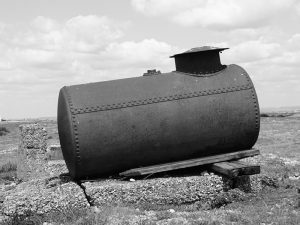 Oil Tank Services will obtain the required permits for the customer and arrange for inspection by the town official along with a utilities mark out. First, we excavate the ground to the top of the tank, then the tank is cut open and all fluids/sludge is removed and disposed with a vacuum truck from the exposed tank. We squeegee clean and rag wipe the interior surface of the tank and remove the cap, fill, vent, supply and return lines. Once the inside of the tank is cleaned, the tank is removed from the ground. The tank and the surrounding soil are inspected for evidence of leakage. If there is no leakage or soil contamination, the tank is disposed as scrap, the hole is filled with certified clean fill, and top soil/seed is installed to restore the site. All necessary information is provided to the municipality to insure a Certificate of Approval (CA) is issued for the property.